The late Siobhan Coffey from Stradbally, Laois. A touching tribute has been paid to the late Siobhan Coffey, who was the coordinator of Laois Youth Theatre. Ms Coffey passed away on Sunday August 27 after an illness. Laois Arts Officer Muireann Ní Chonaill has issued a tribute to her colleague at Laois County Council. "Our treasured Youth Theatre Coordinator, Siobhan Coffey, left this world early on Sunday morning, after battling an illness for some time. She was an inspiration to all the children and young people who encountered her and a much cherished member of our wider Arts Office team. Her enthusiasm and belief in the power of drama and theatre encouraged all those around her. She immersed herself wholeheartedly in her duties as Laois Youth Theatre Corodinator and went well beyond the call of duty. Ní bheidh a leithéad ann arís. We send our condolences to her family and friends at this time". It was Siobhan's request that the mourners wear brightly coloured clothes at her funeral mass. Siobhan Coffey (née Kane) of 12 The Glebe, Stradbally and Athy, Kildare, was a daughter of the late Paddy. She is deeply regretted by her loving husband Séan, daughters Niamh and Orla, mother Ruby, brothers Padraig and Adrian, brothers-in-law, sisters-in-law, nieces, nephews, relatives and friends. Requiem Mass is at 12 noon on Tuesday, August 28 in the Church of the Sacred Heart, Stradbally. Burial afterwards in Oakvale Cemetery, Stradbally. Family flowers only please. Donations, if desired, to The Cuisle Centre, Portlaoise. Donations box in church. 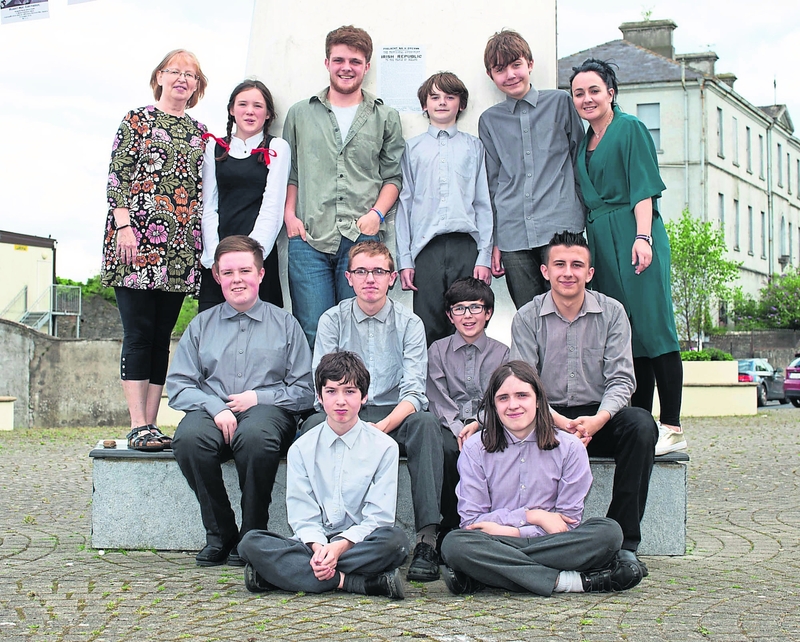 Below: Ms Coffey (top left) with members of Laois Youth Theatre.